Bond no. 9 has launched Saks Miami-Dade, the latest in their series of department store exclusives. The unisex fragrance features notes of rose, cardamom, ginger, grapefruit, nutmeg, tonka bean, patchouli, amber, sandalwood, leather, musk and oakmoss. Bond no. 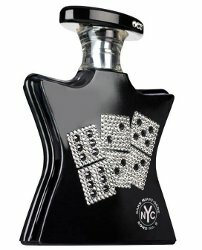 9 Saks Miami-Dade is a limited edition and is available in 100 ml Eau de Parfum. Ha! But trying to figure out what the dominos signify for Miami? There must be some connection I’m missing. As a lifelong Floridian, I can tell you that I immediately thought of the old Cuban men playing dominoes in the park. I like the reference to the older 1950s/1960s era. I’m going to try to get a sample. Only thing I can think of is maybe references to vintage pics of the rich poolside playing dominoes. I honestly can’t think of anything else. See above! Or, could of course just be random. I like this bottle more than the last one..but still doesn’t appeal to me much. The notes don’t sound bad though.